The Brew House Self-cateringQuirky and unique village Brew House that has been converted into a tiny, but perfectly formed bolt hole for two plus baby or dog. Stylish structure and furnishings with local green oak and steel. A lovely setting within the quiet village green, grazing sheep, a river to paddle in, and a courtyard to catch the sun. Inside all cosy and compact with wood stove, super comfy bedroom, hand-built kitchen and wet room with power shower. 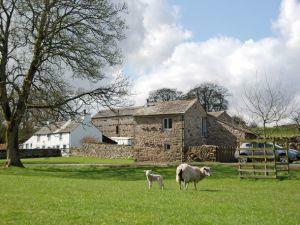 Bed and Breakfast also at the owners Farm House Crake Trees Manor, 5 minutes from The Brew House. Children welcome from any age. The Brew House offers weekly bookings starting on Friday and short breaks of 3 or more days starting on Friday and Monday. From M6 jct 38 at Tebay take B6260 for Appleby. Leave B6260 at junction for Crosby Ravensworth, travel down and through village, continue on to next village of Maulds Meaburn. The Brew House is right at the centre of the village, opposite the village swings. Excellent facilities, the reason I have given a three for services and facilities is due to the door lock, we couldn't get back in one night due to the key not working, however the landlord kindly came out and managed to open the door. The lock was jammed. However our overall stay was amazing, the location was fairly central and some amazing views to be had. Lovely stream running outside and the dairy herd coming past was amazing every morning.